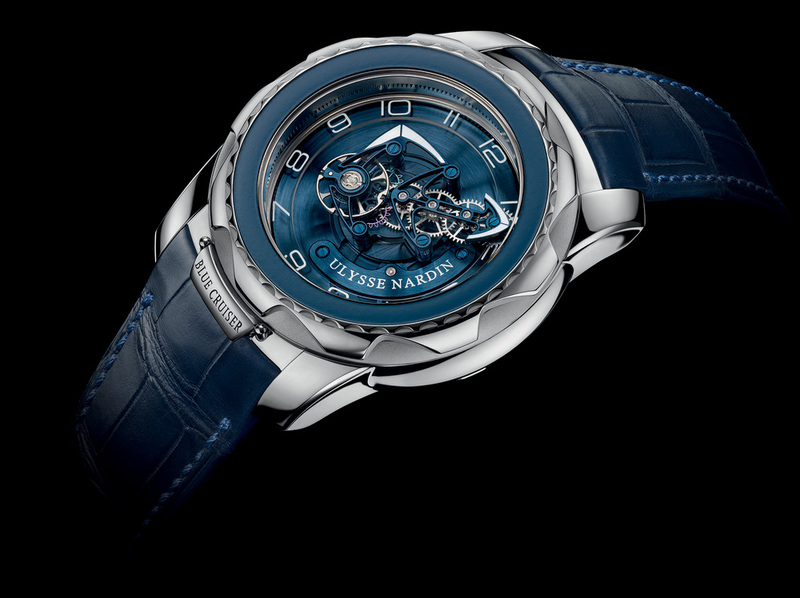 Long before watchmaking materials created in “clean room” laboratory conditions became commonplace, Ulysse Nardin presented their Freak model to the industry, complete with a novel escapement made from silicon. Some of us loved it, some of us loathed it and some just didn’t “get it”. It had no hands, no crown, no dial, a movement which revolves on itself and to create it required some of the best watchmaking minds in the business. 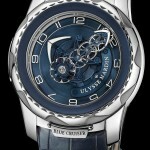 That was back in 2001, and since it’s release, Ulysse Nardin have continue to developed and nurture it. 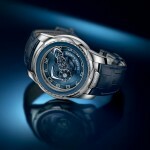 Fast forward to 2014, when most watch companies are delving back into their past in order to re-vamp models for the vintage trend and it is not difficult to see why timepieces with unusual arrangements stand out and, the Freak in its new “Blue Cruiser” guise does indeed demand attention. 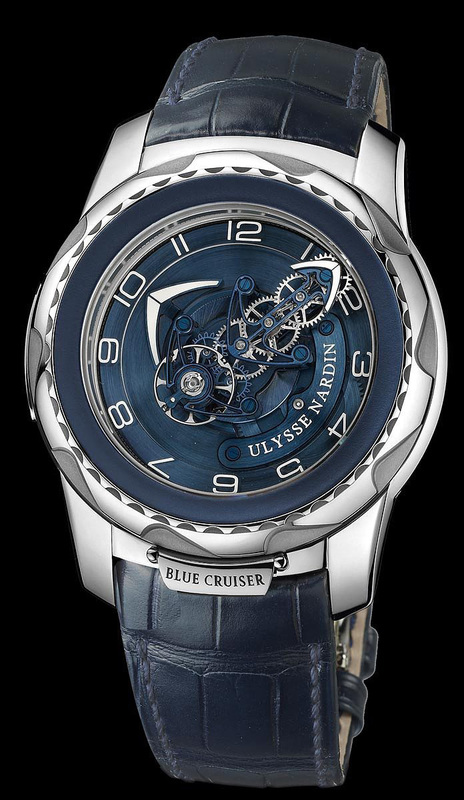 The Ulysse Nardin Freak Blue Cruiser has an appropriately pelagic character with subtle styling touches calling to mind all that pertains to the sea. Even before we come to discuss the highly unusual face-on aspect, the whole thing has the look of a nautical instrument. The rounded case, the broad rim of the bezel, the wide, stubby numerals and the name plate with its visible screws – all are oceangoing aesthetics. 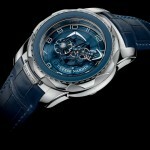 However, unlike other sailorly timepieces the Freak Blue Cruiser is entirely unconventional. 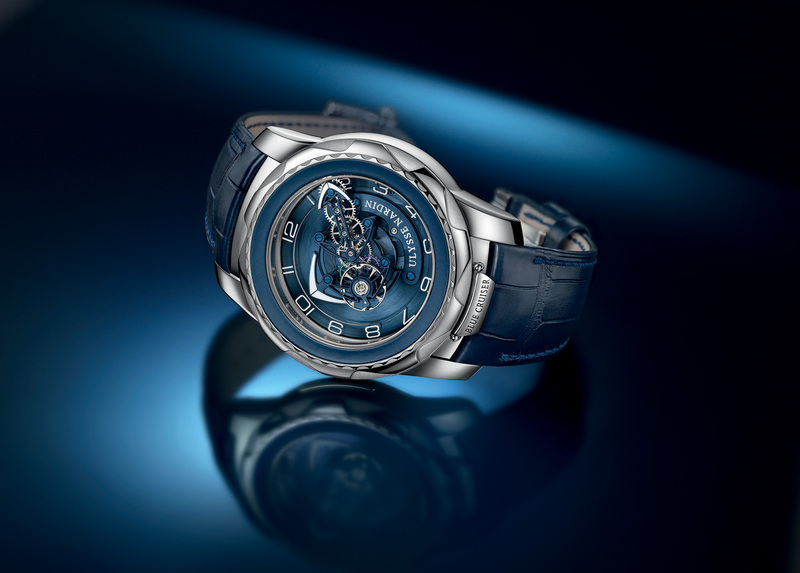 As I have already mentioned, this watch lacks a dial and indicates the time without hands, instead it is designed so that the movement revolves on itself. Connected to the centre, the rotating lower bridge serves to indicate the hours. 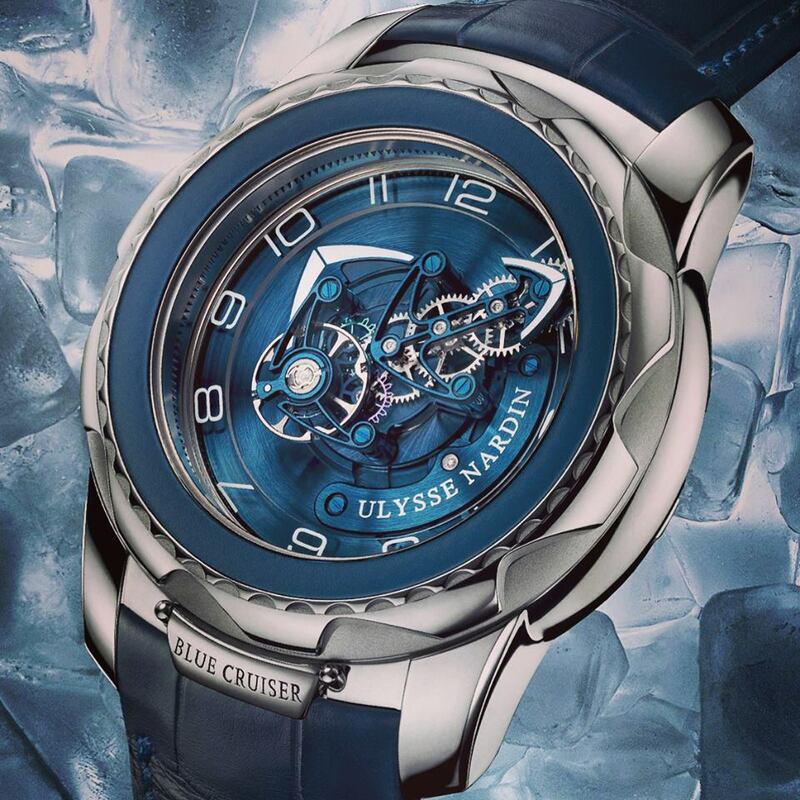 The upper bridge, which takes the form of an open-worked ship’s anchor bears the gear train, the balance spring and the innovative Dual Ulysse silicon escapement, shows the minutes. 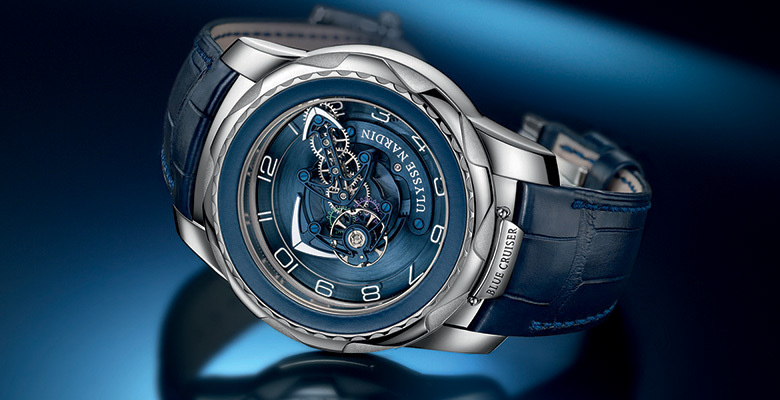 Termed the “Flying Carrousel Tourbillon” the system does in fact offer up the illusion of floating as it appears to rise up and levitate proudly. 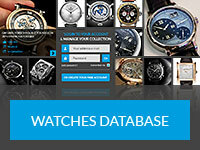 There is no crown to interrupt the rounded profile of the case, time-setting is operable by using the rotating front bezel and can be done either backwards or forwards. To wind this manual-wind piece one must remove the watch and turn the back bezel – no inconvenience is involved though as the model has a power reserve of 7 days. This arrangement presented a challenge for its designers as an extremely long and strong mainspring is required in order to store up enough energy to keep the system ticking for a whole week and a glimpse through a little porthole on the rear provides a look-see at its substantial curlicue. 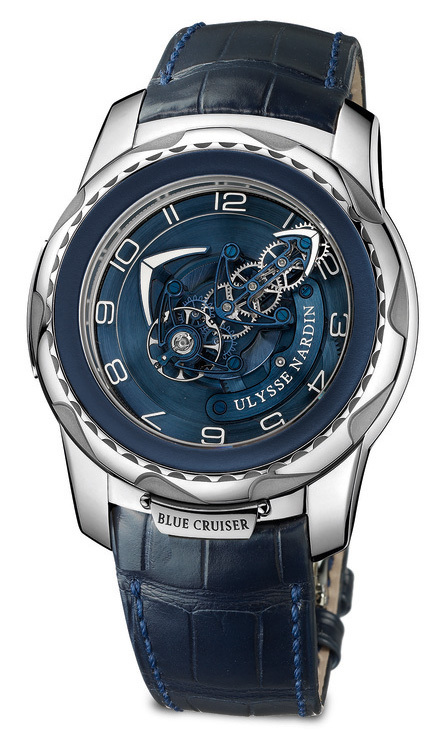 There are some outstanding finishing details on this new model which can only be appreciated at first hand such as the shadow cast by the numerals which are printed onto a sapphire rim positioned above the dial, the contrasting brushed and polished finishes on the case and just between the lower lugs a wonderful little name plate bearing the inscription “Blue Cruiser” is a splendid inclusion.